My eye doctor said I have a stigmatism in my eye! I’m not really sure what it is, but it sounds bad! This phrase is often said with a certain sense of worry. It does sound scary, doesn’t it? Well, let’s try to clarify this mysterious thing called astigmatism. First of all, it is not a disease of the eye. It is simply one of the ways that we describe an out of focus condition in the eye. It is actually quite common. About 33% (one in three) people have some amount of astigmatism, and it can occur in combination with near sightedness or far sightedness. It is generally corrected with glasses or contact lenses, although large amounts of astigmatism are harder to fully correct with contact lenses. Astigmatism occurs when the clear front surface of the eye, the cornea, is shaped like a football instead of a basketball. Imagine this: cut a basketball in half and hold it in front of your eye. No matter which way you measure the curvature of the basketball, it is the same. That is the front surface of an eye without astigmatism. Now picture a football cut in half from tip to tip. Hold it up in front of your eye with the tips pointing up and down. When you measure the curvature from tip to tip, you find a fairly flat curve. But when you measure the curve from side to side it is a steep curve. That is the front of an eye with astigmatism. The difference between the two curves is the amount of astigmatism. 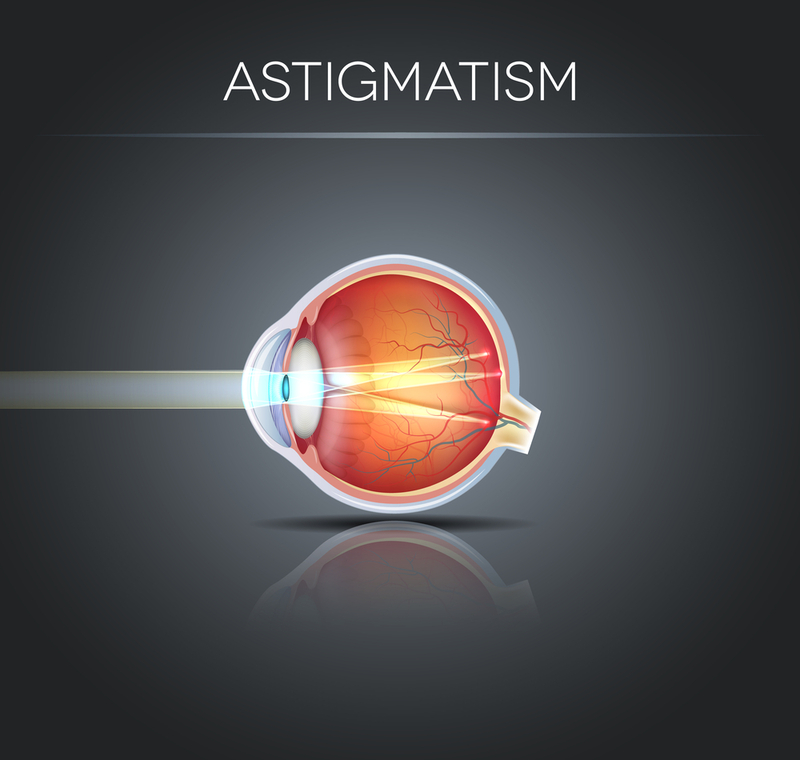 The more difference, the greater the astigmatism. The football could be positioned horizontally as well, or at any oblique angle. This is important because in order to correct astigmatism, we must know what direction it is in as well as how much. Astigmatism is corrected by placing football shaped curves onto the back side of your glasses lens, and making sure the direction of the astigmatism correction in the lens lines up with the direction of the astigmatism in the eye. Yes, it is a bit complicated. But, certainly not scary.